We have written a series of articles as a case study examining whether or not you can hire a company to repair credit issues that are holding you back from being a home owner. 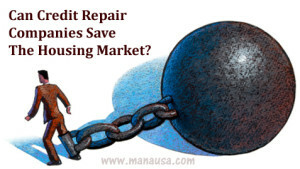 The housing bubble bursting sent millions of formerly "good credit" Americans into a state of damaged credit, and we know that more and more people will be seeking ways of restoring their credit scores as fast as possible. Current mortgage interest rates are still incredibly low, so the sooner you repair credit problems, the better your interest rate will be on the home that you purchase. The real question though is whether or not these credit restoration companies are effective at fixing your credit score any faster than it would recover on its own. Our customer has sent me an update he received from his credit repair company (USCCRA) and things have really shaped up for his ability to buy a home with conventional financing. The key to fixing your credit scores, whether you do it yourself or you hire an expert as our customer has, is to work a system. The Fair Credit Reporting Act (FCRA, passed in 1970) provides consumers with rights, and specifically the right to have the information about them reported accurately. All reported information must be verifiable, and if disputed by the consumer, must be given a detailed response in a certain amount of time. Companies that serve to repair credit issues send a series of letters and demand responses in accordance with the FCRA. Here are the results achieved by USCCRA for our customer after just three months (which has improved his credit score by more than 100 points!). This report shows that our customer has had 11 negative items deleted from all three credit bureaus, and they continue to work on the rest of the negative items in his credit reports. After speaking with our customer earlier this week, I can tell you he is 100% thrilled with the performance of USCCRA and everything that they are doing to counsel him and to repair credit issues on his behalf. If you are wondering what Jim and the USCCRA team can do for you, just visit their website to discover how they might start a process to repair credit issues for you and help you on the path to homeownership. Joe, great insights. You clearly know what you're talking about & are an expert in your field. Thank you for putting together this great resource, I have a friend who's struggling with their credit score, their identity was stolen and they didn't notice until months later (Careless, not reading credit card bills, they were only stealing like $100 a month...).. Anyways, I 'm going to show them this page, it will be a huge help.